Today is the autumnal equinox here in the northern hemisphere. This happens once a year when the sun is positioned directly over the equator on it’s journey north and marks the official end of Summer and the start of Fall. For many LP locals this is a time to rejoice and start preparing for the start of our backcountry season. Soon the temperatures will start to drop, water will flow and before we know it the land will be turning green once again. It’s always strange seeing most of the rest of the country turning brown right when we are turning green. Anyway, right now is a good time to start prepping for your dream week-long LP backpack trip, bagging that peak on your list or getting ready for that ride you’ve always wanted to do. Enjoy the equinox…….. This Saturday, September 26, is the 22nd annual National Public Lands Day. NPLD is the single largest day of volunteerism across the United States. The Los Padres is very fortunate to have a series of volunteer events organized across the forest. In the chance that you are free on Saturday and feel like giving back, check out the list below and sign up to help. Thank you everyone! Over the past few years there have been some great programs designed at teaching adults the basics of backpacking. While it’s never too late to learn how to backpack, it can be intimidating and scary to learn without proper instruction. For those of you interested in learning from some of the best, we are fortunate to have programs across most of the Los Padres that offer an introduction to backpacking. Over the past few years the Los Padres Chapter of the Sierra Club has been offering a course called Backpacking Basics. The course is held each Spring and is based in Ventura. Earlier this year the LPFA hosted a program called Backpacking Fundamentals. We had a lot of fun organizing the class and made some great friends along the way. It was cool to see some of the students backpacking together even after the class ended. James Wapotich and Sierra Butler also taught a course called Backpacking Made Easy, based out of Santa Barbara. And of course there are plenty of classes hosted by REI from Monterey to Ventura that also teach backpacking basics. • The LPFA is proud to announce that we’ll be hosting our second Backpacking Fundamentals Course starting this October. The class will be hosted in Santa Maria and we’re hoping to get some of the North SB County and South SLO County backpackers to attend. If you are interested in signing up or hearing more, check the Meetup Link here. 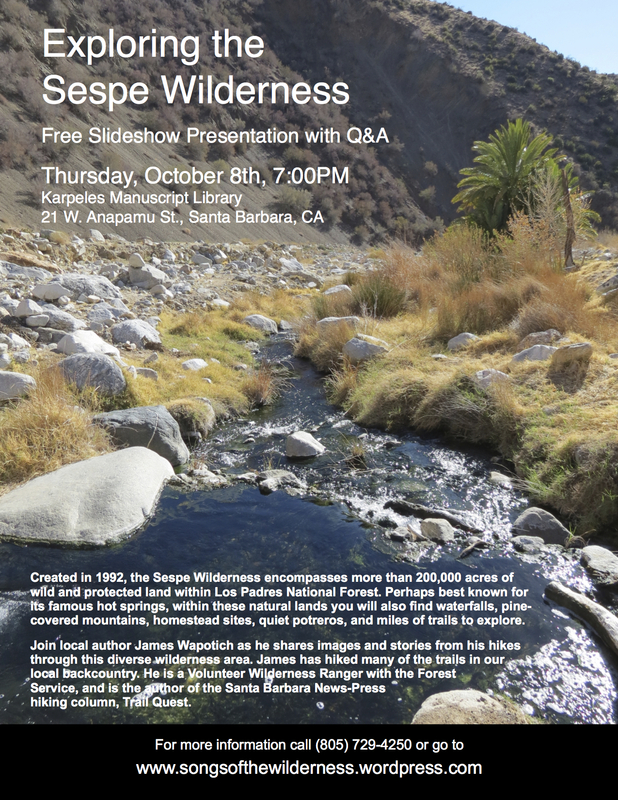 • James Wapotich and Sierra Butler will also be teaching a second Backpacking Made Easy class this Fall in Santa Barbara. Check the link here for more details. it’s never too late to take up backpacking and we’ve found that even the seasoned backpackers can learn a lot by attending the classes. Check it out and hope to see you on the trail, or in the classroom! Actually quite a bit going on at the moment. Here’s a taste! Earlier this week a fire broke out just north of the Los Padres in Monterey County near the town of Jamesburg. Named the Tassajara Fire, it moved quickly and grew to over 1,000 acres in just a few hours. Fire crews got on it quickly and have been able to hold the fire at bay. It currently stands at 81% contained with 1,086 acres burned. Sadly 22 structures including 10 homes were destroyed. Nope, not a new character from Incredibles 2 but this Sunday we’ll be able to experience a rare phenomenon called a super moon lunar eclipse. A super moon occurs when the moons closest orbit around the Earth happens to coincide with being a full moon. This happens often enough but the twist this time around is that there is a lunar eclipse at the same time. We’ve not had a super moon lunar eclipse since 1982 and the next one won’t occur until 2033. So literally, this could be a once in a lifetime experience. The eclipse should last 72 minutes and is visible for us on the west coast of North America. For more information search the World Wide Web, there is no shortage of hype. If you get a great photo, we’d love to see it! Most of the Forest got a little taste of rain last week. It’s been an interesting Summer with now three tropical storms making it far enough north to drop rain around the Los Padres. While most of the rain totals from the latest storm were less than half an inch, we have reason to celebrate! For the first time in a long time we have above normal rain totals. YIPPEE! Santa Barbara is currently at 133% of normal for the rain season. Of course, don’t get too excited, the rain season goes from September 1 – August 30. Some of Ranger Rik’s Quiver, available soon! Error: Error validating access token: Session has expired on Tuesday, 26-Mar-19 15:28:48 PDT. The current time is Friday, 19-Apr-19 00:15:28 PDT.